The need for a cane when mobility problems become worse, can be hard for some MSers. You may feel self-conscious. You don't want others to see you as weak or disabled. You may feel that others see you as being older than you are. The thing to realize is this - you need to consider your safety first. If falling down is in any way a possibility, choose safety over fashion or as they say, vanity. Cir finally gave in to the idea of using one after falling several times at work. I knew he had balance problems, so I was always worried when he was away. I didn't want to get a call one day that he was in the hospital after falling and hitting his head on a store fixture. I continued to encourage him to use one, and he eventually saw the logic behind it. On his job he was constantly standing or walking around. This I felt, for him, was an accident waiting to happen. The weakness in his leg was getting worse. Walking long distances was becoming extremely difficult, if not impossible. 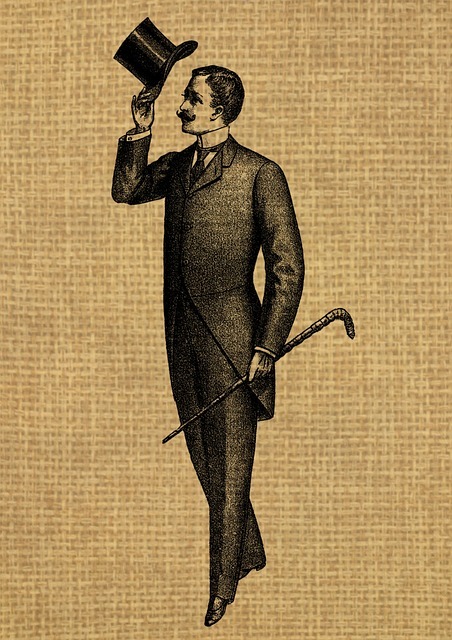 A cane helps you compensate for unsteadiness. If you stagger a lot, seriously consider using this helpful mobility aid. At least when people see you walking around, they won't automatically assume that you are intoxicated. Many MSers have weakness in one leg. Cir's right leg is his weakest. When he first began using a walking stick, he was still working. I say “walking stick” because it was his first one. It's solid wood and looks more like a fashion statement than a mobility aide. It still looks nice, almost as good as the day he bought it. After using it for awhile, he became more comfortable with it and was less self-conscious about how he looked. A small price to pay for being safe. Another piece of advice, we'd like to offer, is to see an occupational therapist. Cir used his cane for years before being seen by an occupational therapist (OT). After watching him walk, the OT told him he was actually using it incorrectly. You are usually supposed to use it on the opposite side of your weakest leg. The OT tried to get him to use it on the left side. He had gotten so comfortable using it on the right, that it was difficult to change. Needless to say, he was safer which ever side he used it on. This usually ended up being on his right, the side he was more comfortable. As a result, he had less falls. Now, years later, he has a collection of them; about 5 or 6, plus one quad cane, which he doesn't use that often. He also has three walkers. A regular one without wheels. One with two wheels and a rollater, which is a walker with 4 wheels and hand brakes. A light weight wheelchair and an electric scooter round out his collection of mobility aides. Sometimes, when weakness is severe, two canes can be used. In Cir's case, he just uses a walker or his rollator. Both of these options are safer than just using one. Cir's OT showed him how to use each one of his mobility aides in the safest way to avoid falls and unnecessary accidents. When you feel the need to use a walking stick, cane, or any of the other mobility aides, ask for an OT. They evaluate you and show you how to used them correctly to gain the most benefit. Cir picked out his first one by going to the local department store. It isn't the best place to get one when you don't know how to use them. But it was better than nothing. It's best to get one that fits you. It needs to be the right height to provide the best support. Your OT or physical therapist can help you figure that out. As I said earlier, Cir's first one was very nice. But you may want one that's a little more fancy. If you are the creative type, you could paint or carve your own. You could add decals. Whatever you like. 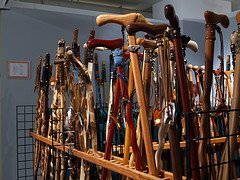 If you aren't very creative, there are many places to find canes or fashionable walking sticks that you feel comfortable using and that can be made to fit you. The key word is “using”. If it's not comfortable or the right size, you probably won't use it. 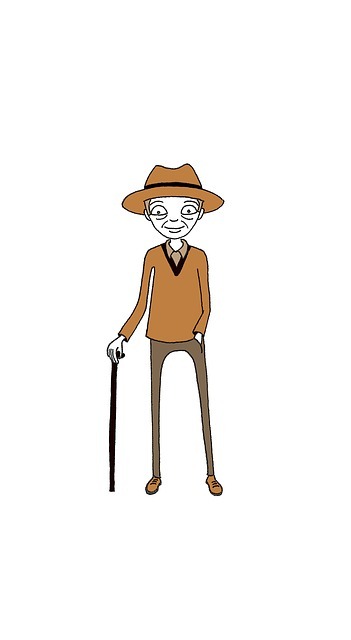 The most important thing about a walking stick is that you use it. Cir has 5 or 6. They are all in places where he can get to easily. Besides the ones in the house he keeps one in the car. There are a couple by the bed and usually one in the dining room. Three of them are adjustable. Meaning he can shorten them to fit in a bag or in a shopping cart easily. That way they're out of the way when he's not using them. Also, our 2 yr old granddaughter has one to play with and it's just the right size for her. The wooden ones are his fashion statements. He uses them when we're going out. He usually carried at least one when we go out. That's in addition to his rollater, walker or electric scooter or wheelchair. So get one and use it! Always err on the side of safety. Need to find out how to choose a cane? Follow this link. Click here to find out how to use a cane? Follow this link.